He will surely be able to say that he got to taste the race ! The guy fueling the car got slammed to the ground when the car took-off. The fuel is very similar to regular automotive gasoline but with some additives to boost performance. In the US the open-wheel race cars burn an alcohol based fuel which burns with very little visible flame and is hard to see. Here is a short video that demonstrates the effect. Ah, this was when Heikki Kovalainen drove too early from the pit so the fuel thing got stuck and started to "spill" fuel on Kimi Räikkönen, the ferrari driver. Good that it wasn't anything serius that could hurt Kimi. #3 he didnt get slammed on the ground.. he just tumbles a little knowing that he is going to get in trouble. #5 i don't know what team it was but i remember something where they pulled out the fuel connector but the pump was still on. #6 I will venture to guess you are kidding, because the fueler does get yanked to the ground quite hard and was sprawled out, looking up at his hose departing the scene. The guy holding the 'stop' sign didn't see that the car was still being fueled, and raised it, so obviously the driver took off. Go, Forrest! Carpooling in my Hybrid is saving the world! F1's get 3.1mpg (1.3 km/l) so they must be harming the environment! 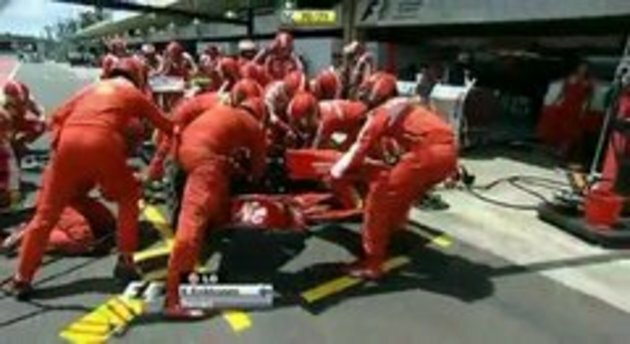 Great seeing Brawn team help Kovalainen. That is sportsmanship. wow.... if it exploded it would of been bad i wonder how hot i was for that guy for that quick second? #2, Isn't octane number the exact opposite of flammability? #15 ya your right the higher the octane the lower/slower the explosive power will be , but propane is 110 it burns slow but normal petrol (in europe anyways) is around 95 its all stupidly complicated and has also a lot to do in what way you set it alight as in set petrol on fire in a puddle on the ground will burn off quite nicely , leave a can of it open for 5mins and flick a match at the vapor will go off like a bang just like what you just saw but (and i have seen this happen) the can most likely wont explode. There is not enough oxygen in the can (if its full enough) and just putting the cap back on the flame will go out . #6 you are correct the guy fueling the car does stumble off to the side!! #3 and #7 there are two guys sprawled out on the floor, most probably are tyre changers!! The McLaren lollipop man.... Doh!!! I am not blind. There is one guy holding the nozel and one holding the hose. The guy holding the nozel (refueling) who fails to remove the nozel from the car, stumbles to the side. The guy holding the hose falls and takes out one of the tyre changers, as there are two people on the floor. Is that "Watching Closely" enough !!! #20 You are trying to make a distinction that does not exist.There are two men fueling the car,one holding the nozzle in place and the other holding the hose over his shoulder and HE is the one thrown to the pavement.Your link to another view makes that even more clear. Thanks for clearing that up. "there are two guys sprawled out on the floor, most probably are tyre changers!!" #21 That is why "Correction" is written at the top of the comment.